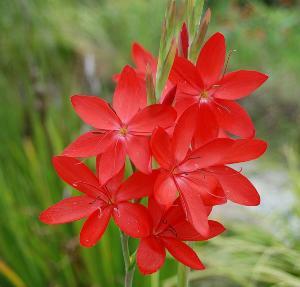 Schizostylis coccinea Major is commonly known as the Crimson Flag Lily. A semi evergreen vigorous clump forming perennial. Grassy green leaves grow to a height of 60cm. With erect stems of up to 10 scarlet crimson flowers 5-6cm in width. Flowers from later summer into Autumn and prefers full sun and moist but well drained soil. Hardy. 1m height by 0.5m spread.